My girl Cara, and lady boss of The Next Native, is drop dead gorgeous and I knew she'd be perfect in transforming this into such a beautiful shoot. Her hair and makeup was kept natural by Jessica Tyransky with a bit of a moody eye to showcase those baby blues! Girl dates to The Dress Theory - San Diego to find the perfect dress were tons of fun - so much so, we couldn't pick just one! If you're recently engaged in the San Diego area, do yourself a favor and pop into this bridal boutique. The bridal boutique is so beautifully curated and expels great vibes! And how beautiful is this backless dress by Christos (Lulu)? I mean this train is absolutely breathtaking. And we certainly can't go without giving credit to the groom. Chris, model pictured and owner of Suitivo, out of West Hollywood, hand-crafts custom one of a kind suits made just for you. They're not only experts in determining the perfect fit, but also at helping you embody your unique style. And this midnight tux tailored to perfection is no exception. For the signature cocktails, I collaborated with the finest: Snake Oil Cocktail! Coming up with two drinks, a his & hers, with their team was a fantastic experience. Their creativity, knowledge, and quality is out-of-this-world. A Charleston Old Fashioned and Provincial 75 - coming right up! Notice the outfit change? Gosh! The suits and gowns were just too perfect to only showcase one. So with that, another Suitvo masterpiece and the stunning Ginger by Miss Hailey Paige. Greenery and florals aren't just meant for bouquets, arbors, and tables. By draping lush foraged greens over the plush sofa by Pow Wow Design Studio, it created a truly romantic lounge that any wedding guest would be sure to relax in. Native Poppy went above and beyond to design and arrange the oversized bride's bouquet, a glorious table centerpiece fit for a king and queen, and these handsome boutonnieres. Psst! Insider's secret: Also check out Native Poppy's adorable shop in North Park, San Diego. It was always a highlight of my week to visit while living there and also to snag a lavender latte from the shared space at Communal Coffee! 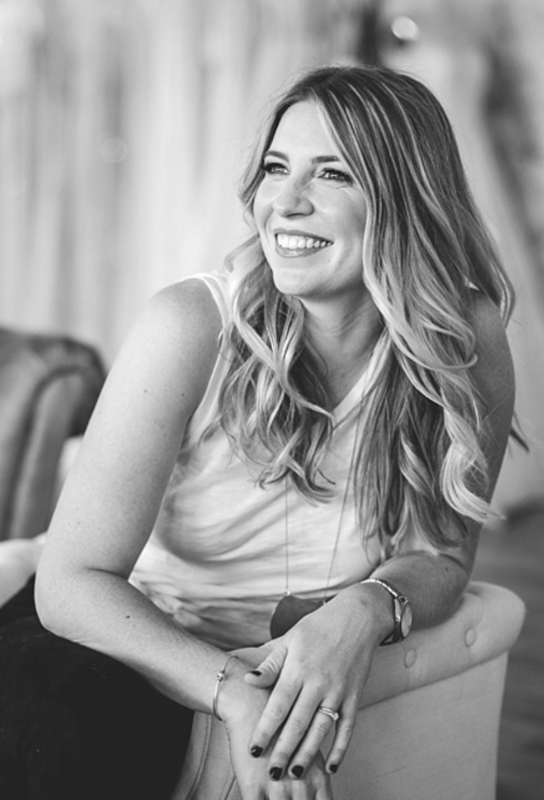 Kasia Jewelry introduced her fine jewelry collection after first launching her Simply Kasia line in 2014. Her designs are delicate with unexpected, feminine details and an emphasis on slight asymmetry. Just look at those unique stones! Guys - need a custom ring that's perfection? Call my girl Kasia! The custom wedding invitation suite designed and printed on natural cotton paper by my friend and creative business gal pal: Kimberly Gilroy of Sunkissed Paper created a look of casual luxury. And last, but definitely not least. My absolute favorite piece to style - the tabletop. Keeping with the timeless aesthetic and venue's history, the classic chargers matched perfectly with the simple salad, dinner, and bread plates. And you just can't go wrong with the classic wine glass, water, and champagne coupe! It's hard to select a favorite part of this shoot, but it might just have to be this flatware from Casa de Perrin. Rose gold is oh-so-dear to me. Not only did my husband select a rose gold ring engagement and wedding band for me, he chose one for himself! It is an unexpected and completely flattering choice for the guys! The fine linen Tuscany collection by La Tavola adds the perfect elegance while still keeping a relaxed feel. And another insane highlight of this shoot - custom calligraphied (is that a word?!) name cards and this stunner-of-a silk table runner. I approached Loren of Four Things Paper with this idea, and I just knew she'd create nothing less than perfect. It's subtle, unique (think favorite song lyric unique! ), and can be used for decades to come at dinner tables, gatherings, and occasions. The DIY toss bags were filled with fresh flower petals and hand calligraphy again by Four Things Paper along with her signature custom cocktail bar signs. I always try to encourage couples to use focal points native to the venue. 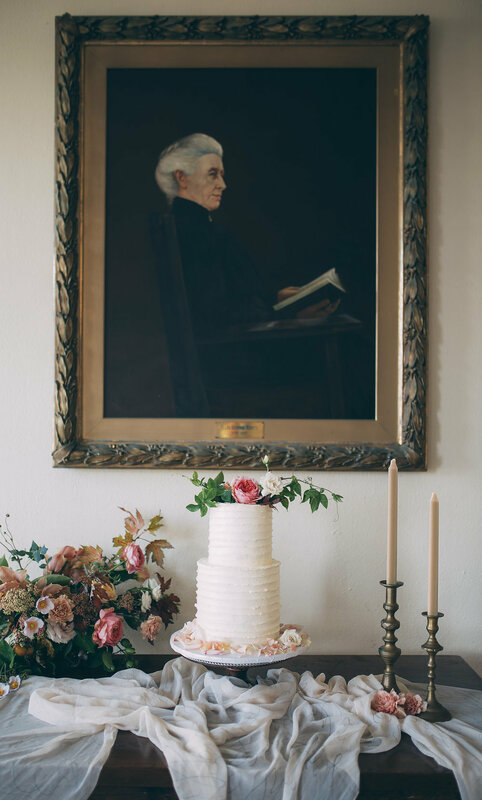 This portrait at the La Jolla Woman's Club is a piece of history dating this venue back to 100 years and made the perfect location to display the simple textured cake designed by Sweet As Bliss. All of these incredible photos taken by Fog & Dawn Photography! There was a lot of heart that went into this shoot and no detail left untouched. To inquire about Lion House design and coordination services, let's chat! For more inspiration, we'll see you back here on the blog!